The #1 selling high-tech concept for clearing toilets at the touch of a button – in a safe, easy and cost-effective way. 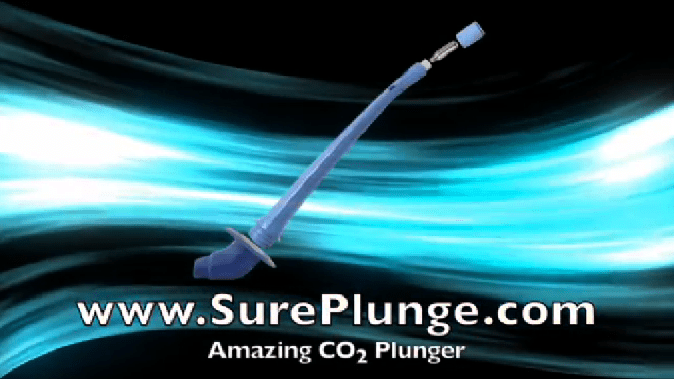 The SurePlunge Automatic Toilet Plunger with the power of CO2 . Now you can easily unclog your toilet in an instant – literally, at the touch of a button – using harmless compressed CO2. The SurePlunge Automatic Toilet Plunger is the best toilet plunger you will ever use. Well, it’s as Easy As 1-2-3. The SurePlunge Automatic Toilet Plunger forms an airtight seal around the toilet drain before a single blast of compressed CO2 instantly dislodges and clears the clog. 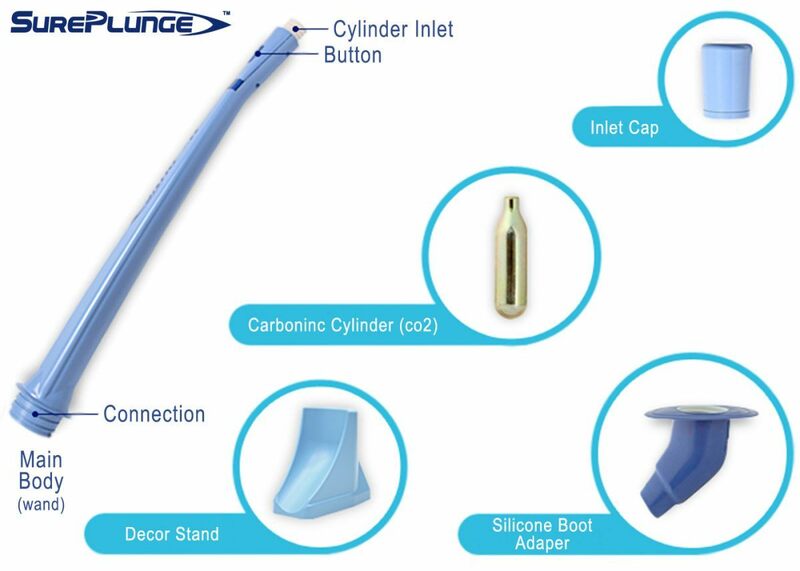 The SurePlunge will clear even the most stubborn clogs standard plungers or rods cannot shift. The SurePlunge can also be used regularly to keep pipes perfectly clear. The SurePlunge Automatic Toilet Plunger is Awesome to Use. No Harsh Chemicals. No Plunging Manually Up & Down. No Snaking the Pipes. The SurePlunge is Highly Effective. Simple and Safe to Use. Use the SurePlunge and avoid costly plumber calls. Clear the hardest clogs yourself with the easy-to-use SurePlunge Automatic Toilet Plunger with the power of CO2. We are confident that you’ll agree that the SurePlunge Automatic Toilet Plunger is the Best Toilet Plunger you have ever used. Not only is the SurePlunge automatic toilet plunger easy to use and effective, it is also safe to use on everyday common toilet clogs. The SurePlunge uses a small, single-use cylinder of compressed CO2 gas. This is an innocuous gas that is more commonly used to carbonate drinks. So it is harmless. 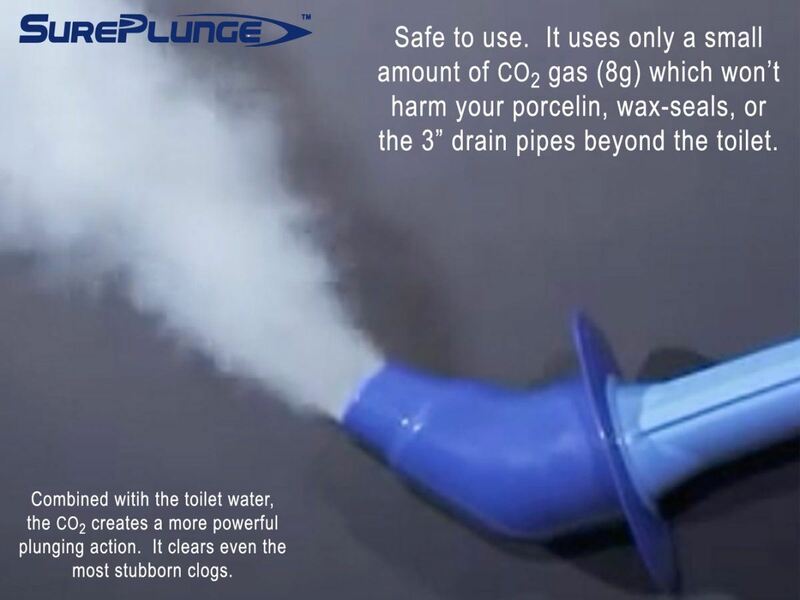 The SurePlunge automatic toilet plunger delivers the correct level of CO2 gas pressure that is enough to push the water forward and dislodge the most stubborn clogs without harming porcelain toilets, wax seals, or plumping pipes. Should the button be pressed accidentally outside of the toilet bowl, the SurePlunge simply emits a cloud of CO2 gas that will cause no harmful damage and will look similar to a “dry ice” cloud that you see on the dance floor!